There are a number of attractive things about thorium power; but the one that attracted my attention today related to the question about what to do with the long term storage of waste from traditional uranium fission reactors: incinerating it in a thorium reactor seems to be a neat idea. Looks like Corbyn is not going to get his glorious revolution. I tend to agree; renewables are now too cheap; it’s now a science exercise. It looks like they are going to give it a red hot go though. BB its an argument for at least keeping the capability to quickly build gas generators. But it also depends on a lot of things – like how large our reserves of liquid ammonia (hydrogen) are. Thanks for your long and informative post. I have one quibble. You blithely state that the waste from Thorium would ‘only’ take 500 years to decay. This is roughly saying that waste from a nuclear reactor built in the reign of Henry VIII, or Martin Luther would by now be as easy to dispose of as ‘coal waste’. or if it had been built when what is now the USA was colonised, it would be safe in another two or three human lifetimes. Of course , this is only 10% of the entire history of the human race, if the Bishop of Armagh is to be believed! The trouble is that even if we started building reactors, there’s no way they could be up and running in anything like the time the human race has to solve its current problems with pollution, to give it its real name. (‘Greenhouse gases’ sounds too benign, with pictures of hydroponic tomatoes and the like). “Looks like Corbyn is not going to get his glorious revolution”, according to a Blairite sh_t rag. Andrew as I said, nuclear power (including thorium) is dead. Its too expensive and slways will be – for reasons of basic physics and engineering. It would be a smart move for government to keep a Coal-Fired or Gas-Fired power plant on Care and Maintenance. Though I imagine I, for one, wouldn’t really want to survive a ‘nuclear winter’ without immediate access to power for an extended period of time. I suppose a nuclear reactor dropping out of the sky from several thousand meters at 600kph is not that big a problem. “At the centre of the fuel rod is the ‘seed’ for the reaction, which contains plutonium. So a thorium reactor would actually be a plutonium-uranium-thorium reactor. Yeah. Nah. That’s not the reason why there is no thorium reactor commercially operating in the world. Also the issue you identify of concern is actually the neat trick I was talking about. The reactor rods you are talking about are more safe than the rods that are already in existence AND they get ‘incinerated’. This means that all those war heads, transitive waste elements can be converted into much more benign and manageable substances. The reactor itself is subcritical – which means the risks in the actual reactor are of a magnitude less than uranium reactors – they can’t meltdown. Andrew_Earlwood, I vaguely recall one or even two start-ups in the Seattle area getting into “Thorium Candles”, with a little bit of backing from B. Gates, 15(?) years ago. They idea was that much of the raw material was literally standing around at Hanford, and so easily available and safer inside a candle. The safety benefits were clear if you could make it work. One business plan was to put the candles on boats or barges and ship them to disaster areas or remote locations as short term emergency power. Each candle would burn from one end to the other and last 40 or so years. Given the silence I expect difficulties intervened. This would go double for civilan passenger aircraft. How about hydrogen as a portable fuel for aircraft? So this is what Niki Savva was referring to on Insiders this morning. The support of former Prime Minister Malcolm Turnbull’s son, Alex Turnbull, for several independent political candidates, including Kerryn Phelps in his father’s old seat, is part of a long-term plan to challenge the major parties and reduce the influence of the Murdoch family over Australian politics. 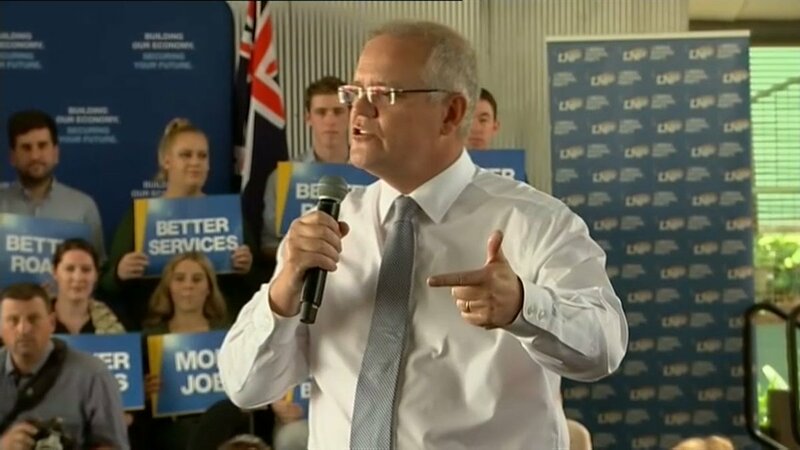 “If you want to destroy News Corp’s influence in Australian politics you need to provide the infrastructure for lazy members of the incumbent parties to face challenges from their constituents,” he said in an interview on Sunday. In time frames of 100 million years or so, these are high probability events. In time frames of 10 thousand years or so, these are incredibly low probability events. However the point about diversifying energy production sources is valid. Which is why it is a good idea that the renewable energy mix include: solar, wind, hydro, geothermal, biogas and eventually tidal. Which as far as I know it already does. How he addressed and framed criticism of policies, for example characterizing the franking credits refund as a ‘gift’. He appeared well prepared and on top of his brief. In a word ‘competent’. Just the right amount of confidence. He emphasized his team, bringing them on stage for the conclusion. A first term Labor government won’t be a socialist paradise, but while open to criticism,I think it will surprise people by how progressive it it. By all means press such a government to go further, but any final judgement should wait, hopefully after 2-3 completed terms. The Chinese and Indians would beg to differ. They seem to think that thorium is scalable in a cost effective way. It seems that both countries have having an each way bet – still building some traditional uranium based reactors (which are necessary for their indigenous nuclear weapons and military nuclear power programs) AND developing thorium reactors (which aren’t militarily necessary). However, it seems the rush to thorium has stalled. It will be interesting to see whether there is a revival or the various programs are ultimately shelved. I for one would like to see at least a few dozen thorium reactors up and running – if for no other reason than to incinerate the existing stockpiles of nuclear waste and warheads. Which 4 seats are Labor going to win to get to a majority of 76 seats? What would the waste become after mastication? It’s atoms, and they don’t disappear. They may become transmuted by action of neutron or alpha or beta bombardment, but they still exist, usually as radio active atoms. Have look at what the bookies think. All the seats are here. And the bookies are not often wrong on these matters history has shown. No ideological responses please. This is not an ideological question. Does the wind stop for this long dark tea time of our society? A large fleet of steam locomotives should be deployed as a reserve transportation capability. And run often to keep them in good nick. Copy and paste the article’s link into Outline and you’ll get this. From a friend: Winx for PM! Way ahead in the polls. Doesn’t shoot her mouth off. Good nag > knackers nags. Don’t know about Section44-compliant she has an Irish dad, Street Cry and a Kiwi mum Vegas Showgirl. Apparently she was born here. Don’t want to nag, but does she have to renounce. But significantly if you had been at the yearling sales, her great great grandfather on her mother’s side was the great 1964 Kentucky Derby winner Northern Dancer, the preeminent sire of the last half of the 20th century. On her father’s side, three generations back there were the also great Nashua and Native Dancer. I think Pastor ScoMo is proclaiming a miracle! Less revenue due to maintenance of tax rorts and tax cuts for the rich on the one hand and higher spending on services and a nett improvement in the budget position! The last long darkness drove some interesting literature, we’d probably still be all slaving away at jobs in high rise buildings. Could someone who was at Burwood for Bill’s great speech tell me whether he was using a teleprompter. That will teach me to always scroll down! Whenever the renewables v coal/oil/gas gets a bit hot for the latter, they chuck in nuclear. BK, I am anti gambling so I do not visit gambling sites. Piers might have had his photo deleted from Abbott’s twitter feed, but he’s not about to go quietly. This whole thing is just gold for Zali Steggall. I dont think that decision needs to be made now. Existing coal power stations will be around for a while yet. Small modular style options (nuclear, diesel, gas and even wood gasifiers) could be built – some quickly some not. It would be which of the options will lose the whole feed in infrastructure under the weight of renewables. I cant see deisel and gas production collapsing any time soon. But you raise a good point. It would be good to have some easy to access fossil fuels in the bank for super volcano day. jenauthor, it should be a landslide, but I doubt it will be. He was using a TelePrompTer – you could see it. It was a long speech – to be expected, especially considering the number of ‘details’ he quoted. Edi – since I “work” with gambling industry, I can tell you following the money isn’t the most sensible option. In an 8-10 horse race favourites win in 2 of 5 races. That said – politics cannot be compared to horse racing. Betting is even more vulnerable to emotion that opinion polls. I never gamble either but the bookies’prices are a very good indicator. The following Mackerras pendulum shows the notional margins for seats following boundary redistributions in Victoria, Queensland, South Australia, Tasmania, the Northern Territory and the ACT. Based on a) ABC analyst Antony Green’s calculations of the effect of boundary redistributions for the next election, b) Coalition MPs moving from the government to the crossbenches, and c) the outcome of the 2018 Wentworth by-election, the pendulum has the Coalition government on 72 of 151 seats with the Labor opposition on 71 seats and a crossbench of eight seats. It is a two horse race based on the preferences of a bunch of hacks (us) in a system set up to avoid landslides… with reputable news/entertainment outlets determined to give each side equal credibility (or lack thereof) and so many rusted on voters. Are those canny Scots stealing Australia’s National Hydrogen Roadmap? A google search did not turn up a Dr Donald MacRae at the CSIRO!! “A NEW blueprint has been drawn up to turn Scotland into a global powerhouse for green energy – a move which economists and scientists say would be transformative when it comes to the wealth and standing of the nation. The study lays the ground for Scotland to take full advantage of the hydrogen revolution. …………. The Scottish economist and scientist who head up the new HIAlba-Idea think tank say Scotland could effectively fuel the proposed European supergrid, and generate so much money for the economy that the nation could establish a Sovereign Wealth Fund, as Norway did with North Sea oil. The UK failed to set up such a fund.